Here are this week’s work at home jobs and ways to make extra cash. Click on the links to visit and apply to each job opening. Remember these are active job listings so if you visit this blog post at a later date these positions will most likely no longer be available and these links inactive. 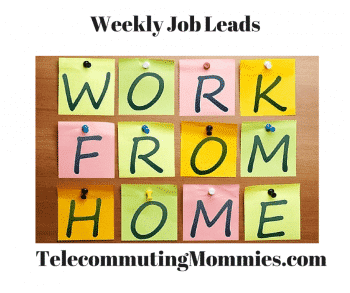 You can also visit my Work at Home Company Directory for a list of companies that hire telecommuters on an ongoing basis, view jobs from the Job Search page or search here for more remote jobs.